Value Proposition: Why do customers act? 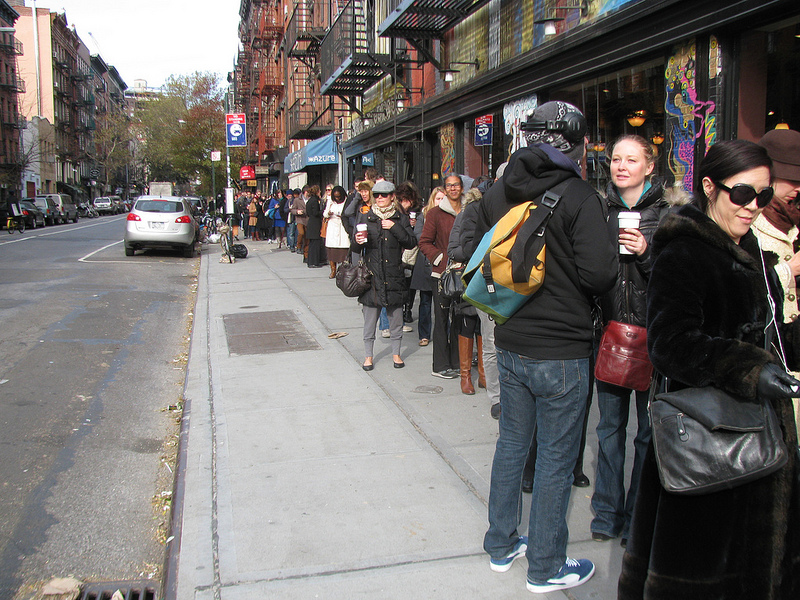 Some people waited more than four hours to vote in the recent election. And people camp out in front of Apple stores for the latest iPhone releases. In most other areas of modern life, any minor delay of inconvenience is greeted with anything from annoyance to sheer rage (check out #FirstWorldProblems on Twitter). So why on earth would someone camp out in line for a phone that, once they get it, they complain about when it takes a moment too long to give them the information they want? And how does this affect why customers act on your offers? Essentially, for anything you ask your customers to do, the value force has to outweigh the cost force. What’s in it for your customer? The value force considers how your customer perceives the benefits of taking the action. Why does your product offer more value than any other product your customer can buy? Additionally, are you clearly and credibly communicating that? Of course, this goes beyond products. This applies to any “ask” you make to your customers. For example, a paid search ad. Do you communicate more value than any other paid search ad or organic result on the page? As you can see from the scale above, value is relative to the cost inherent in taking the action. When the cost is extremely low, the perceived value doesn’t have to be that high. “Can you do me a favor and pass me that pencil?” Sure, the perceived value is low (she sees me as a decent guy) but so is the perceived cost (I just have to reeeeach). That said, the value can’t be nonexistent. For example, putting “Like us on Facebook” as a call-to-action (CTA) on a billboard, print ad or menu. The cost isn’t that large – whip out my phone, find you on Facebook, click like. But, what, if anything, is the perceived value communicated by that call-to-action? So why do people camp out for iPhones and likely pass by stores selling many other perfectly capable phones to do so? While the perceived cost is extremely high (wait days for an expensive phone) the perceived value is even higher (be the first to buy the coolest tech product in the universe, dude!). And why did people wait hours in line to vote? Again, the perceived value (make sure that other guy doesn’t get into office / get reelected and totally mess up our country) outweighs the perceived cost (standing here waiting for the world to change / preventing the world from changing). I read this post on the heels of another (involving sales weaknesses) which I had planned to share with our sales team. Your post posed a question which further inspired me: Why does your product offer more value than any other product your customer can buy? Additionally, are you clearly and credibly communicating that? It’s something good for me to have top of mind w/ marketing , but this is key in sales, as well. And I shared with them my own little addition: even if you think that a decision is “kind of a no-brainer,” avoid using that terminology. It diminishes the value and offers nothing substantial to think about. Instead, tell your client that it makes good sense to do XYZ for the following reasons. Yes, it takes a little more effort on your part, but it will give them something to grab on to, something to wrap their brain around, something that will stick in their heads. And it will also make the client think of you when they think of the reasons. Now I have some work to do, too! Thanks for the food for thought!! Spot on about the principles of marketing. Apple seems to have employed a great marketing strategy making consumers think that they “needed” their products unlike other brands that only have a “want” mindset around their products. One of the outstanding items i’ve read in the week.